Start shaping up and hitting the pavement, because the San Diego Half Marathon is returning to downtown SD on Sunday, March 10th, revamped, rearing and ready to go!! Registration is open for the San Diego Half Marathon - a one-of-a kind race and fundraising event with 100% of its net proceeds benefiting local charities. Building on a hugely successful inaugural race, the 2013 event will feature the same amazing start on Tony Gwynn Drive under the Omni Sky Bridge and will follow a signature scenic course that showcases San Diego’s beautiful bayfront and historic communities. New for 2013 will be a ‘5K’ course, a shorter, fun-filled option with the same starting line and some of the same spectacular views as the half marathon. Both races will have a new, downtown San Diego finish, featuring a live jumbotron and a “Celebrate San Diego Food & Brew Festival” to congratulate participants. “Legacy & Friends” special pricing for the half marathon and “First 500” special pricing for the 5K are available for a limited time. Learn more at sdhalfmarathon.com and get important updates via the events Facebook page (facebook.com/sdhalf) or Twitter feed (twitter.com/sdhalf). The 2012 San Diego Half Marathon successfully raised and donated more than $100,000 for community service projects including Lake Murray Playground Project, San Diego Police Department Communications Division Kitchen & Break Room Renovation, Toys for Joy, Robb Field & Hickman Field upgrades. As with many charity races, runners in both the half marathon and 5K are able to individually raise thousands of dollars for local and national charities of their choice, while creating goodwill for all San Diegans. “Designed with a ‘runners-first’ perspective, the 2012 San Diego Half Marathon was a refreshing and exciting new race for the running community," commented Paul Greer, long-time San Diego Track Club Coach. 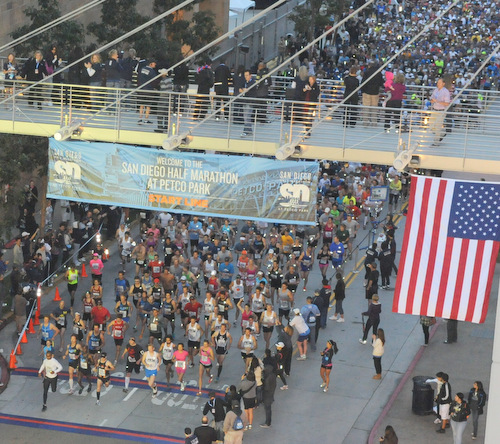 "The downhill finish through historic downtown is undoubtedly the best finish to a half marathon in San Diego! I am looking forward to 2013!" The San Diego Half Marathon is a premier, unique race and event that celebrates the beauty and uniqueness of the city of San Diego while raising money to help local community charities. The organization is a nonprofit 501(c)(3) with all net proceeds benefiting community service projects and select charitable causes in San Diego. In addition to charitable giving, the San Diego Half Marathon was created to catalyze volunteerism as a way to build community spirit and boost neighborhoods in need of support. The event culminates in a unique “Celebrate San Diego Food & Brew Festival” finale that brings together food, drink, music, runners and their supporters. The charitable San Diego Half Marathon strives to make a meaningful, positive difference in the lives of the San Diego community and beyond. The Celebrate San Diego block party is free and open to the public. Bringing together some of the business world’s best executives with decades of experience in management and event operations, the San Diego Half Marathon has the ideal team to ensure a unique experience for runners and spectators alike, so be sure to include family and friends. More information is available at www.sdhalfmarathon.com or www.facebook.com/sdhalf. 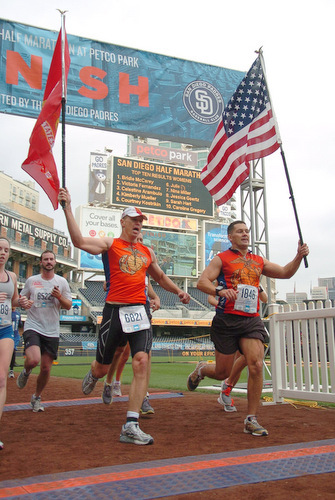 Businesses interested in supporting their community, please contact sponsorships@sdhalfmarathon.com. Registration is currently $109 per person for the half marathon and $39 for the 5k. Register online a www.sdhalfmarathon.com/event/register.